redFox Environmental is proud to offer a compact line of marine toilets. The redFox marine toilet is a self-contained toilet that's ideal for fitting into tight spots where conventional toilets can't fit. 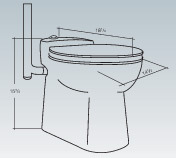 This modern shaped self-contained toilet is very water efficient, using just one gallon of water per flush. It was designed with several purposes in mind such as limited space, green conscious users that want to save water, and for people with physical limitations requiring easy access to a toilet.